If you were anything like me, you grew up with skim milk on the table; you had cereal and milk for breakfast, teddy graham crackers dunked in milk after school and a big ol’glass of milk with dinner. We were told that we needed to drink our milk to grow and to keep our bones strong, everyone remembers “Got Milk” right? Wrong! Wait what? Milk is NOT essential? Our bones won’t break without it? From every angle milk was the good guy (skim of course), it made our bones strong, was low in calories and was a part of a balanced meal. 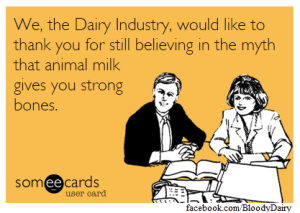 This, along with some other made up super milk hero stories, was and still is fed to us via the USDA (United States Department of Agriculture) and the dairy industry probably because they wanted to keep cashing in on milk and dairy sales. We have been told for years that dairy is an essential food group and that if we want strong bones we better make it a part of our balanced diet. We were told that it was a) rich in calcium, b) rich in vitamins and minerals and c) needed for bone health. Then, somewhere along the way we were also told that SKIM milk was good for us. I can even remember telling my neighbors when I was young that they needed to switch over to the non-artery clogging skim milk, I was brainwashed! The one major flaw in all of these shenanigans is that Vitamin A and D are both FAT SOLUBLE vitamins, a big fancy word meaning they NEED fat in order to be absorbed and used by the body. So plain and simple, skim milk is just watered down white colored juice that has little to no redeeming qualities. Well then what about WHOLE milk? If it is coming from conventional cows…which most of our milk supply is…it is coming from a very unhealthy source. These cows are being given hormones to supply the milk our country demands. Those hormones travel through the cow and into the milk which you then consume, gross right? You want a cup of emotions with your Oreos tonight? I didn’t think so! These cows are also more likely to become sick due to their less than natural GMO infested diet. Cows are ruminants and thus thrive on forage and grass. So when the cows eat these grains they get sick, when they get sick they must be given medication…which then goes into the milk…and then you get the rest right? So if you want to eat dairy you should just make sure it is all grass-fed then, end of story? Milk is a highly allergenic food. Many of us cannot tolerate the proteins (casein and whey) and even more of us are intolerant to the sugars known as lactose. Then, if you are already gluten intolerant/sensitive and/or have Celiac Disease, milk protein is a cross-reactor, which means that your body detects the milk protein the same way it does gluten (womp-womp! ), a major NO GO! Just know at the end of the day, milk and dairy are hard to digest. Our bodies were not meant to require milk past infancy and even then it was human milk! Our guts (known as our small intestines) house most of our immune system and they take a beating every day so do yourself a favor and see if dairy is doing damage by eliminating it for 30 days! Side note: grass-fed cows are happy and healthy cows and have some of the best tasting meat out there…more on that another day! Note: I do not recommend other substitutes such as soy or rice milk. But wait! What about your bones? Won’t they become brittle and frail if all dairy is eliminated? Keep in mind your body does not rely on a SINGLE nutrient to maintain it’s structure, therefore calcium alone does not create strong bones. Your body requires all different vitamins, nutrients and lifestyle factors to maintain strong healthy bones including: Vitamin D, magnesium, exercise and much more! There is more to good bone health and proper growth than milk and dairy! So I dare you to give up dairy for 1 month and see how you feel. When you add it back in look for signs of intolerance whether it is GI distress, headaches, foggy brain, unwanted weight gain, asthma, acne or poor sleep quality. Take my truth and try my dair(y) elimination for 30 days and see how you feel! Next Next post: Healthy Tips & Tricks To Prevent Colds and The Flu Naturally!